ROCK Sydney (Representative Of Christ's Kingdom) is a local Indonesian community church located in the heart of Sydney, Australia. ROCK Sydney church is led by pastor Samuel Yusuf and his wife Lydia Yusuf. Please subscribe to our Podcast to listen to powerful and dynamic teachings of the Bible or visit ROCK Sydney website for more information. 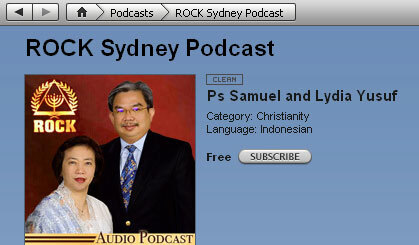 How to listen to ROCK Sydney sermon podcast? 1. Directly through iPhone and iPod Touch. 2. From your computer using iTunes and iPod. If you have any questions, visit our Frequently Asked Questions section. 1. Listen to sermon directly from iPhone/iPod Touch? 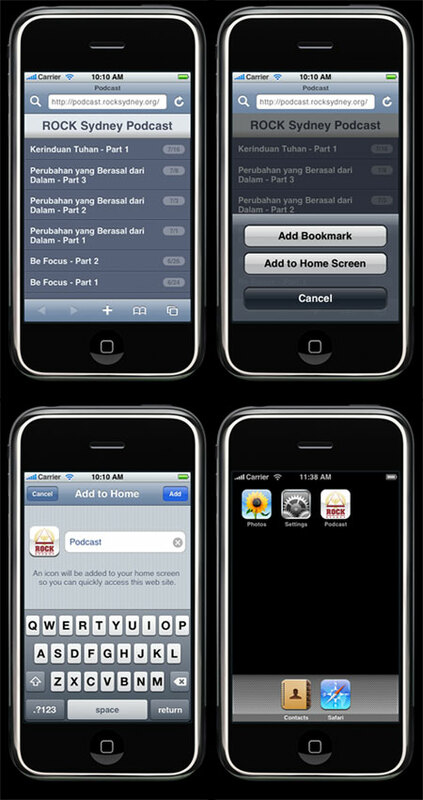 To add a shortcut to your Home Screen, (step 1) touch on the + button, and (step 2) touch "Add to Home Screen", finally (step 3) touch the Add button. To subscribe to the podcast, search for "ROCK Sydney Podcast" on iTunes store. If you do not have iTunes you can download iTunes for free. Step 1: Open iTunes, and click on " iTunes Store" on the left-hand-side panel. Step 2: On the top right hand corner, in the "Search iTunes Store" box, type in "ROCK Sydney podcast", click Enter. Step 3: On ROCK Sydney Podcast page, click the "Subscribe" button to subscribe. 1. On your iTunes, click on "Advanced" menu item (located on the top of iTunes), and click on "Subscribe to Podcast..."
What is ROCK Sydney Podcast? ROCK Sydney Podcast is where you can listen to powerful and dynamic teachings of the Bible. The sermons are recorded from ROCK Sydney church's meetings. Do I need iPod to listen to podcast? No, you can listen to the podcast on your computer using free program like iTunes. If you have any other questions, please use the contact us form on ROCK Sydney website. 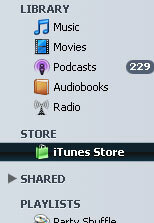 To download free iTunes software, please visit iTunes download page.